Wash Day with New Protein Treatment..An Egg! 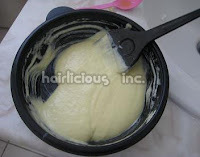 - Hairlicious Inc.
Wash Day with New Protein Treatment..An Egg! This past weekend I noticed a couple broken hairs while finger combing my hair. It wasn't many broken hairs but enough to make me realize that I'm in need of a stronger protein treatment. Plus, I relaxed approx. 1 wk ago, so its time for a protein treatment. I usually use Aphogee 2 min 1x a month. After doing more research on it, a protein treatment should be left on the hair for 15-20mins in length as opposed to 2 mins. Plus when I used ApHogee, my breakage wouldn't stop completely...there were still a couple broken hairs after the treatment. I didn't want to use this again. With that being said, I remembered Traycee's protein treatment where she uses an egg, a cheap conditioner, leaves it on for 15 minutes. I was attracted to that since it seemed so simple and easy. 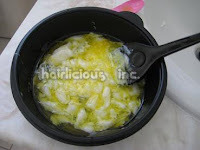 With my mix, I used 1 egg, Aussie Moist conditioner (put enough to cover the entire egg in the bowl) and 3 tsp of EVOO. This mix can be runny so be careful while applying. I left it on for 15 mins with a plastic cap (no heat), rinsed and followed up with my DPR/AtOne Mix for 30mins w/ heat (lovess it). As my hair was air drying it felt sooooooo soft, noticeably thicker, very poofy and I had more waves in my hair than normal. Once my hair was dry, I moisturized and sealed, no broken hairs in my hand, nothing!! My hair felt much stronger and was retaining moisture evern better than before. I was so happy. After that I styled my hair & went out. I will be doing this treatment 1-2x/month now. Ooh, your hair turned out so beautiful! Come over to the light side, girl.. forget commercial conditioners..you're living proof that an egg is a sufficient for a protein treatment. Do you know if there is such a thing as too much protein? I recently transitioned to a natural and my hair is really long and I condition with Aveda reconstructor just for strength. Well I used the egg, mayo, olive oil mixture. I washed out my hair and it felt hard!! So I had to put my regular conditioner in afterwards...Which made my hair soft again. Is there such thing as too much protien? Great site!! Check out my site for great hair, fitness, beauty and random ignorance. Your hair air-dried very nicely! How long did it take? wow! you've made a load of progress! your hair grows so fast! it looks marvelous! keep up the great work! @ Ms.S - thanks hun, it took about 3 hrs to dry completely. Thanks Quenquen! Normally after a wash I just air dry and then bun. On this particular day I used heat in the front for the curl. I am very excited about trying this treatment today. Thanks so much for the tip. I like the idea of leaving the protein treatment on more than a couple minutes without it getting rock hard. I will re-post and put my .02 in about how it turns out. If my hair is severly breaking (Probably from lack of protein) should I use this egg treatment every week? Or is it too much. Did you use just the yolk of the egg or including the whites?